I received a promotional item in exchange for this review and super bowl recipe but all the opinions are 100% our own. Did you know that the second biggest food day is the Superbowl? It makes sense since for people like me I just like to watch the commercials and eat great food. Superbowl recipes are all about the presentation as well. Stores are filled with football napkins, plates etc. 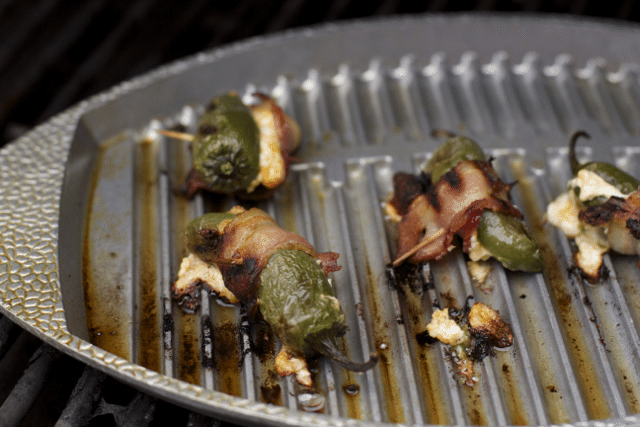 I am thrilled to be sharing my experience making grilled Jalapeno Poppers on my new Armetale football griller pan. 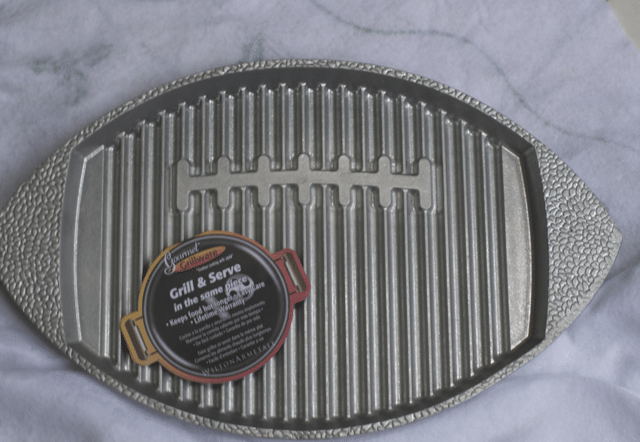 I have a grill pan but the Armetale football griller pan is so versatile and can go from Grill & Serve in the same piece. Perfect for prep; grill cooking, stove top cooking and oven cooking. Now for this delicious and make ahead Superbowl recipe. Be sure to have a pair of plastic gloves on when working with any hot pepper. And do not touch your face at all during the prep, you will regret it! Mix your cheeses and spices together, having room temperature cream cheese will make this process so much easier. Load up your Jalapenos. We might have gone over board as they oozed out during cooking but they still tasted amazing. Wrap them in bacon, everything tastes better with bacon. Then you can wrap them up and wait for game time to grill or place it directly on your preheated grill pan and let the magic begin. You can do this in the oven as well. 8 ounces cream cheese, room temp. Preheat an outdoor grill for medium heat, and lightly oil your grill pan. 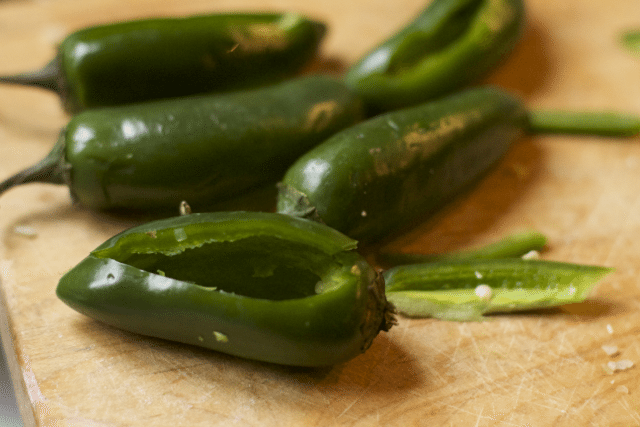 Let it warm up while you prepare the jalapenos. 2. Mix together the cream cheese, Parmesan cheese, garlic powder, and Cheddar cheese in a bowl until the mixture is thoroughly blended. 3. Using rubber gloves ideally, lay a jalapeno pepper onto a work surface, and cut a lengthwise sliver from the side of the pepper, exposing the seeds and white membrane. With the handle of a teaspoon, scrape out the seeds and membrane, leaving the hollow pepper. Repeat for the rest of the peppers. Chop up the pepper slices, and mix into the cheese stuffing. Stuff each pepper with cheese mixture, and wrap each stuffed pepper in a half bacon slice. Secure with toothpicks. 4. Grill the poppers on a less-hot part of the grill until the peppers are hot and juicy and the bacon is browned, 30 to 40 minutes. Be sure to turn them every 10 mins or so. Be sure to enter the group giveaway below where FIVE people will have a chance to win their own Football Griller! 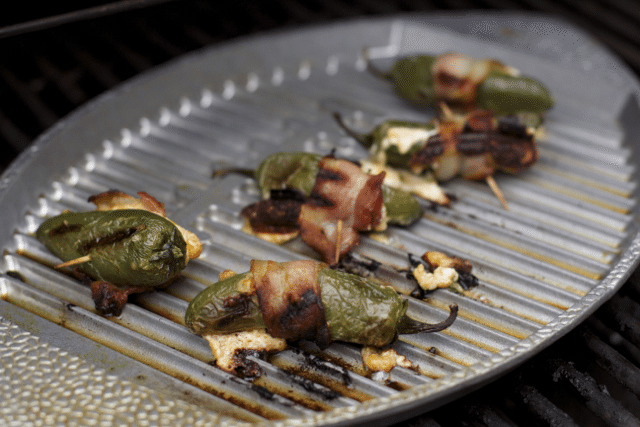 Bacon with jalapenos. Oh goodness my mouth just watered and went to heaven. My husband would absolutely die if I made these for him. I like the Bless This House Bread Tray. 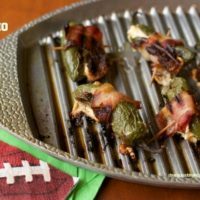 I bet my hubs would love to have those on our Super Bowl menu! I’d like the daffodil chip and dip plate. These look easy to make and delicious. You are correct that everything tastes better with bacon! 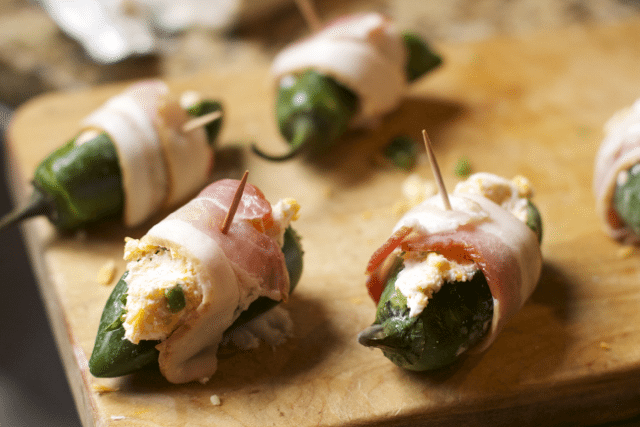 I LOVE Jalapeno Poppers and these look delicious!! I can’t wait to try them!! YUM!!!! I’ve never tried grilling them before, but now I really want to! They look so good! If you can wait be sure to enter the giveaway…. My mouth is watering just looking at these. 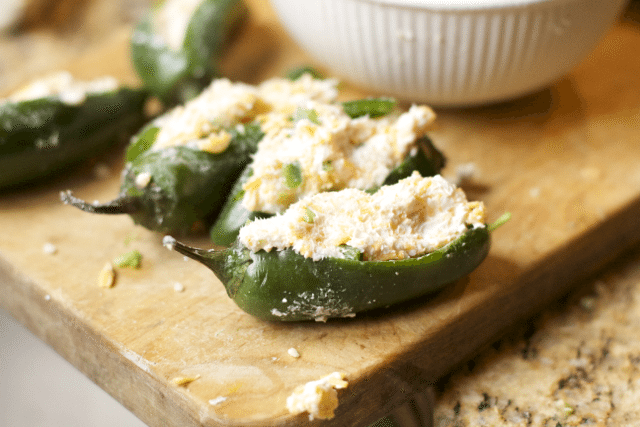 I love jalapeno poppers but have never made my own. Thanks for the recipe. These look yummy and what fun grill!! I love jalepenos! I’ll have to use this recipe even though I won’t be having a game day. These look so amazing! I love the bacon wrapped around them! I love that pan. The poppers look great. The deep dish pan is great! Wow, those look delicious and I love that griller pan! Perfect for the big game! Poppers make me happy. I’ve never had them grilled though, I’m curious! OMG! I am ordering this grill pan Right NOW!! What a cool thing to add to our game day dishes collection. I am so excited about it!! What neat products! My husband would love the Ohio State college grill. Now this is a treat hubby and son would love. they like their poppers. Those look delish! All I need is a few jalepenos and I can make these. These look delicious! Great Superbowl idea!! I know this is about what goes ON the grill but that football grill/tray is the cutest thing ever! I would love to get one of those! What a neat grille, I have never seen anything like this before! I bet my husband would like this! 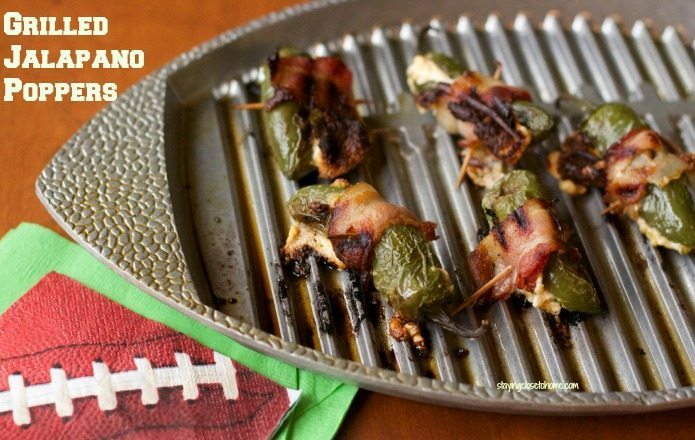 Since the Pats made it into the big game, we are having a party and these are perfect to serve!! Yum! I like the Seashore large round tray!